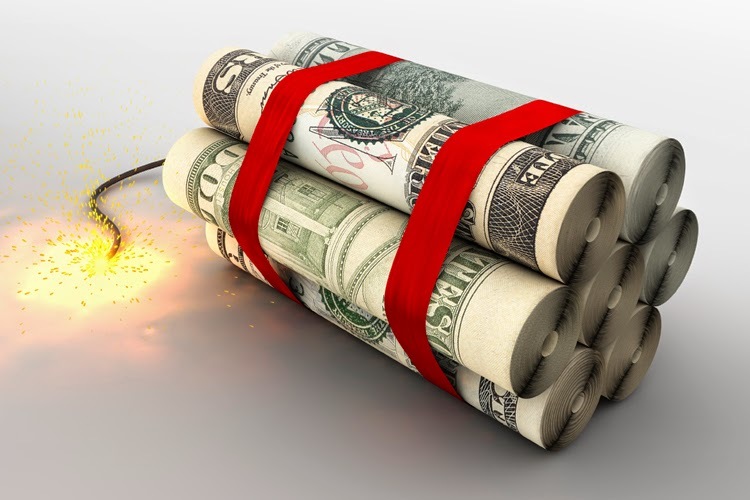 Cognitive Dissidence: Walker Arms Another "Bomb"
In 2009, while Scott Walker was still Milwaukee County Executive, he created an artificial financial crisis. In order to address the supposed crisis, Walker wanted to impose an indefinite work hour reduction for AFSCME-represented employees, cutting the workers' hours - and pay - until the alleged deficit was resolved. Another error that Walker made was that he left the furlough open-ended which was contradictory to a previous arbitration hearing. In 2010, Walker went after the workers again. This time, he created a deficit in his budget by factoring in concessions from the unions, even though he refused to come to the bargaining table to even ask for them. When the unions didn't make those concessions - again because Walker refused to negotiate - he imposed up to 26 furlough days on AFSCME workers. As with his first attack on his own employees, this one eventually was found to be illegal and the workers received their back pay a few years later. Unfortunately, these stunts were only precursors for things to come. After becoming governor, Walker immediately set about creating yet another "financial crisis" by giving away hundreds of millions of taxpayer dollars to his cronies and campaign donors. Before Walker was done handing over the last fistful of cash, he declared the state to be in a financial crisis and introduced the misnamed "budget repair bill" which became Act 10. As the gentle reader is all too aware, Act 10 was a failure of epic proportion. It took $3 billion out of the state economy, making it go stagnant. It cost tens of thousands of people their jobs and caused even more people to take big cuts in their take home pay, worsening the economy even further. With the economic devastation of Act 10, Walker also gave massive tax breaks and giveaways to the rich. This led up to the predictable deficit of $1.8 billion - you read that right, billions with a "b" - that the state is currently facing. Even before that deficit was announced, when we learned that the state was facing a revenue shortfall of $115 million, there were already calls for another budget repair bill. Now that the deficit is so large, it gives Walker and his Teapublican allies in the legislature more than enough excuse to arm another bomb for Walker to drop on the state. Because of the size of the deficit, Walker doesn't even have to settle for just rolling public safety personnel - cops and firefighters - into Act 10. He can go for the whole thing and push for the Right to Work legislation, which has already been written and is just waiting to be introduced. It's no longer a question of whether Walker will drop another bomb on the state but a matter of when. Terrific post. So important Wisconsinites get out and vote Walker & Co out in November. Even if Burke wins, Walker will still drop the bomb in a special session. Burke is not our savior. We are our own and we need to be ready for that fight. Walker won't be able to get it done in a lame-duck session. Only 1 GOP Senator has to say "No" to those schemes, and Schultz and Ellis both despise the Governor and the ALEC crew for pushing them out of office. Don't forget that the Repugs own sell out Lena Taylor and who knows who else. We were betrayed by supposed Dems at the end of 2010. No reason to believe it won't happen again. But this time Walker can't blame the shortfall on his predecessors. How many months ago was he gleefully proclaiming a "surplus" and handing out tax cuts (maybe enough for a family to order a pizza)? It's his mess and he OWNS it. Gosh, Toto, I guess we're in Kansas after all. I'll keep repeating this, the, Walker Engineered Deficit Crisis™ (oh my, WEDC !!) also creates the, "emergency" situation to justify fire sale prices for the pending mass sell-off of public assets to Scotty's BBF's. $1.8M already spent to get that list appraised and ready for the no-bid transfer from the public trust. Which "realtor," is going to get the sales commissions in this action? I believe this deficit is/will be the pretext for raiding the WRS funds during his next term. Without question that's in the cards. Just like what Christie did in NJ, skipping payments. Not so sure he'll get the chance to even try it. I predict state employees will be the victims of the Walker Engineered Deficit Crisis. More divide and conquer tactics coming your way. The solution offered will fall on the backs of the public employees who need to make sacrifices for the hard working people of Wisconsin. You know, we tighten our belts when the going gets rough. This is not a revenue problem, it is a spending problem. And of course, public employees are the problem. This ought to fire up the base and turn into an "us versus them" argument that only benefits Scott Walker. Nah. 2011's over, and people will see through it. "Expansionary austerity" is a proven failure outside of the bubble. This is all on the stupid tax cuts and other giveaways to corporations, and I'd sure hope the Dems hit this point HARD in the next 8 weeks. If elected, Walker will cut back the number of sick days, and vacation days for the state employees. He will claim that it will save the state 75 billion dollars, and plug the hole in the deficit.